We need near-term AND long-term strategies, but there's no strategy now for rapidly increasing near-term risks. Climate damage is happening now, but CO2 emissions cuts can't bring relief for decades. 1250 doesn't compete with CO2 cuts, it complements them. 1250's goals are midpoint of climate policy: bringing quick effects akin to geoengineering, with no danger of side effects, they resolve part of the problem, rather than mask it. Arctic = planet's freezer - a freezer chock full of stockpiled methane frozen carbon bombs. Frack our way over the ‘bridge fuel’ to nowhere? Like 350’s 'Do the Math' on fossil reserves and climate, 1250 questions the math on natural gas as 'bridge fuel.' Think about it! The number 1250 is a near-term interim target for atmospheric concentrations of methane (1250 parts per billion) akin to the long-term 350 (parts per million) stabilization target for CO2. The non-CO2 forcings deserve emphasis comparable to that placed on CO2. Expected difficulties in slowing the growth rate of CO2 and eventually stabilizing atmospheric CO2 amount make the non-CO2 forcings all the more important. We are in a planetary climate emergency. As in all emergencies, the order and timing of our responses will now become critical. According to some of the world’s preeminent sea ice experts, one of whom is a member of this group, the Arctic summer sea ice minimum could rapidly drop to near-zero (with a September minimum of 1 million square kilometers in extent or lower) quite soon now, decades sooner than predicted by most major climate models. Because of the immense stores of methane and other carbon locked in the Arctic, the dramatically accelerating input of summer insolation into the Arctic ocean as more and more of the summer sea ice disappears, and the possible interconnections between these Arctic changes and increased extreme weather at the mid-latitudes where so many humans live, the risks of allowing the Arctic to melt unchecked are becoming untenable. Something must be done about it. 1250’s mission is to help increase awareness of, and contribute to the development of, intelligent and well-informed near-term climate strategy to help alleviate this crisis, without interfering with the rapid transformation of energy systems and other needed actions to achieve immediate and dramatic cuts in our emissions of CO2. In this way, 1250 provides a vital component missing from the ‘350 movement’ begun by Bill McKibben. 1250 is not just an advocacy group for methane cuts, moreover. Rather, it is a group focusing on near-term climate as a whole, and the remaining practical pathways to constructing a ‘climate bridge’ to a stable future. Steep black carbon cuts, for example, will also be essential to building that bridge. The non-CO2 contributions to current warming taken together still exceed those of CO2 (they total about 57% of warming since industrialization), so there is considerable potential to alleviate our immediate situation through these means, and black carbon cuts in particular could bring their benefits very quickly and attenuate the accelerating Arctic crisis. Unfortunately, however, ‘doing the math’ accurately these days also suggests that even with the most rapid reductions of black carbon, methane and other non-CO2 components (in addition to massive CO2 cuts, of course), emissions reductions alone will not long be able to keep the rapidly shifting Arctic stable. 1250 thus also advocates an immediate, holistic Arctic ‘rescue package,’ including some mild, local engineered interventions. We agree fully with the goals of Greenpeace and their ‘Save the Arctic’ program, but apart from pledging to keep out fossil fuel interests, Greenpeace has not yet detailed any way to save it. If the Arctic is left to keep melting, moreover, it will become well-nigh impossible to stop the fossil industry from moving in, making this one the largest societal tipping points of our time. Either we move in the direction of 1250 – which demands a change of consciousness about the plurality of climate change causes and cures – or we will quite likely slide inexorably into a catastrophic future, even if positive steps are taken to move towards clean energy and lower CO2 emissions. 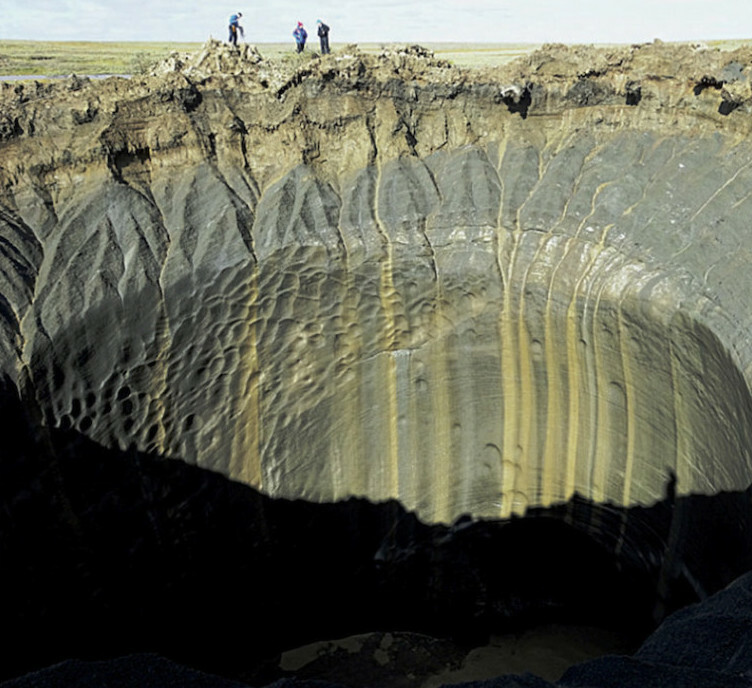 Above, one of the methane craters recently found in Siberia, a veritable symbol of the potential for unpleasant surprises involving Arctic methane: craters like these are not, in themselves, about to impact climate, as has been noted by David Archer at Real Climate, but as both Ed Dlugokencky, top methane specialist at NOAA, and Carolyn Ruppel, chief scientist for the U.S. Geological Survey’s Gas Hydrates Project, recently discussed at NBC News, they do give a worrisome picture of the degree to which the Arctic is now shifting. Such a shift could become unstoppable and catastrophic.